Hope was discovered barely surviving on the side of the road. Left alone, without her mother, Hope has found a new life full of joy. Ray was rescued just two weeks later in a similar, dire situation in need of love and care. Kernel Almond, our ‘Pretty Boy’. 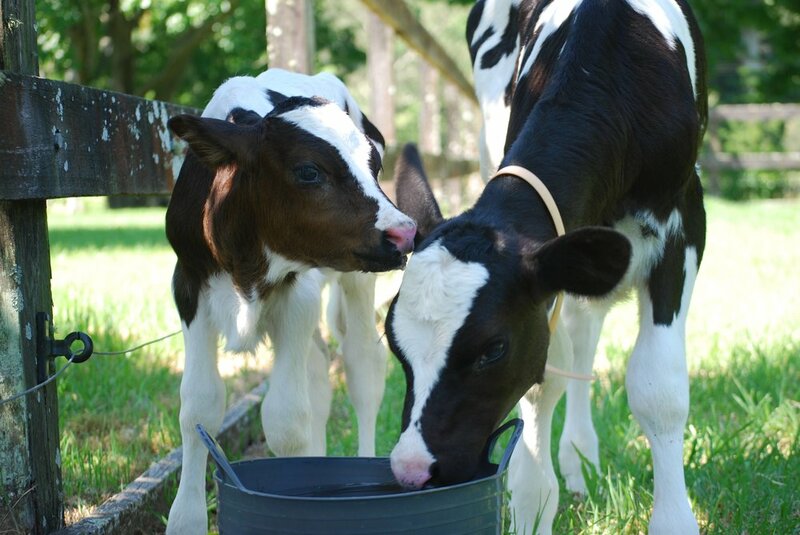 Rescued from a dairy farm near Taree, NSW. This famous biscuit-resembling good-looking gal was rescued alongside her best friend Kernel. Our bubbly & confident Fresian Heifer. Best friend of Tassie and Barney. She looks out for her mates- especially cares for our delicate Barney. 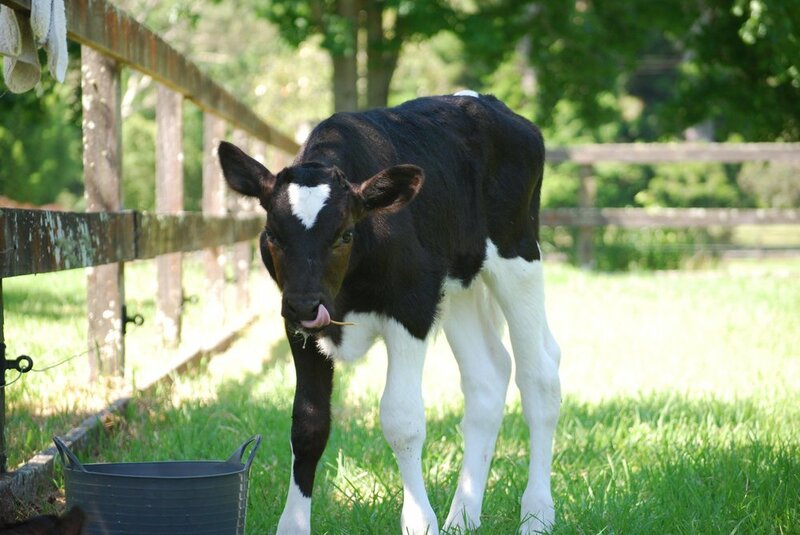 Our Handsome Bobby Calf. Amongst caring for Barney alongside Daisy, he also likes to kick anyone or thing that gets near his back legs…. watch out!! Our loudest resident! She demands to be heard. However, her voice will not be silenced here, at her new oasis. She will live out her days with her twin boys by her side. Now they have been rescued, this darling family can grow together, bound joyously side-by-side. Whilst Rose will be able to watch her boys grow without the worry of ever being impregnated and her babies stolen again. 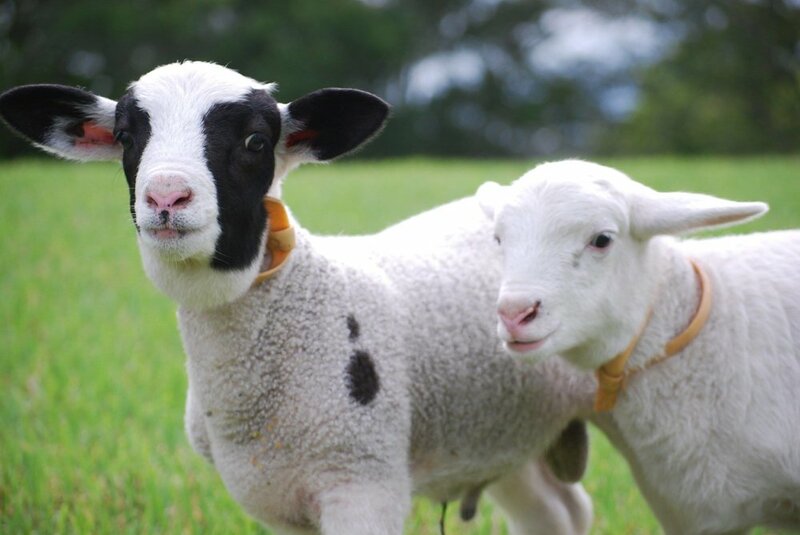 Tahini and Tamari are the shaggy shepherds of the resident sheep. The alpacas provide important security and companionship for all of the sanctuary's resident sheep and lambs. Our chooks of the Farm. Rescued from the side of the road, they are now going to have a stress-free life of pecking and dancing! Sunday lives in paradise along with his mates Missy and Rustus. Sunday devours watermelons, pumpkins, apples and sweet potatoes. He loves digging holes and planting/harvesting pumpkins and watermelons in his spare time. Missy is caring mother to male goat Rustus. They now live peaceful, joyful lives on the sanctuary amongst their best friend Sunday. Howie was rescued when he was just weeks old and in dire straights without his mother and her milk. Tender love and care helped him through such a critical stage of life. He is now thriving and still growing! Howie loves back scratches and often runs around the paddock in joy. Fabio, Ruby & Diamond now live happily amongst the other rescued hens here at the sanctuary. Fabio rules the roost amongst the roosters and is quite the gentleman amongst the lady hens! These four liberated battery hens range the large orchard and love dust-bathing under the fruit trees. They were so lucky to have been rescued by the inspirational Catherine of NSW Hen Rescue. They live amongst Roosters Snowy and Cornelius. Lizzy has settled in well with sanctuary resident sheep and alpacas. She was rescued from a life of neglect. She was found wandering the roads with a badly infected udder, a result of excessive milking and abuse. We look forward to helping Lizzy keep recovering and growing to see her through a long and joyful life. Lentil was in need of a home after his owner had exhausted all options in rehoming him. Thankfully, Animal Welfare League NSW rescued him and reached out to us to arrange his rehoming. From a Rescue Shelter, Nala lives up to her name. She is a true hunter, and loyal friend to Harley. Our oldest resident, Harley, loves to run and play with Nala on the property. Our delicate little boy. Although we only got to be his friend and show him what kindness and love is for 39 days, we will continue to save animals like him, for him. Not only was Barney born a male calf (considered ‘a waste product’ in the meat & dairy industry), he was also premature which made him less than profitable in the industry. Thus, he was left in a muddy paddock to die with flies swarming his eyes and tick-ridden. After countless vet visits and the nights we spent in the barn by his side, he was still in so much pain. With our hearts full of sadness and love for this beautiful boy, we had to let him go. Though, he has fuelled us with more passion to save farmed animals, because even though his time with us was fleeting, he got to know unconditional love from us and his friends Tassie and Daisy.